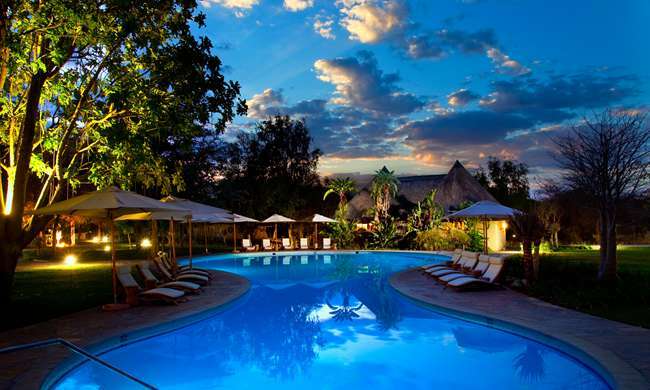 A five star Olthaver and List Leisure Hotels' Mokuti Lodge Namibia, one of the oldest hospitality establishments in Namibia, is located at the eastern gate to the Etosha National Park, in Tsumeb town area. 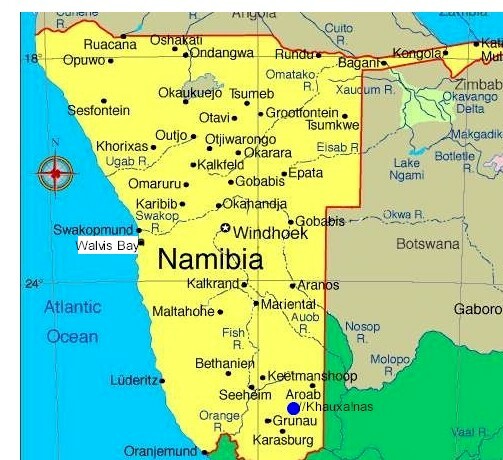 Mokuti is situated two kilometers from the Eastern entrance of the world renowned Etosha National Park in the Northern part of Namibia and is easily accessible by road or by air. The thrill of adventure and the awe of unique surroundings, envelop you from the moment you enter Mokuti Lodge. Experience lavish hospitality, exhilarating recreational activities, peace and tranquility. 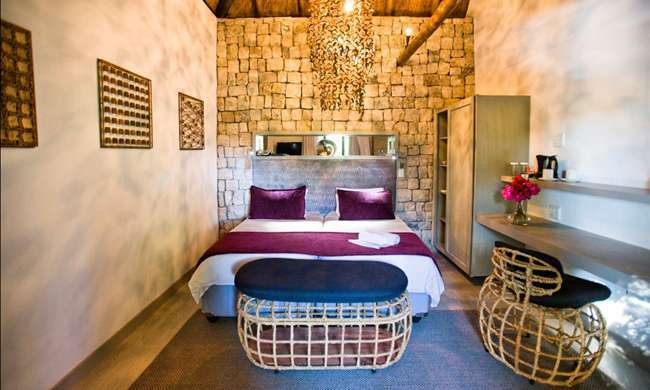 Choose one of the Mokuti Lodge rooms and anticipate the harmony between natural beauty and extravagant comfort. 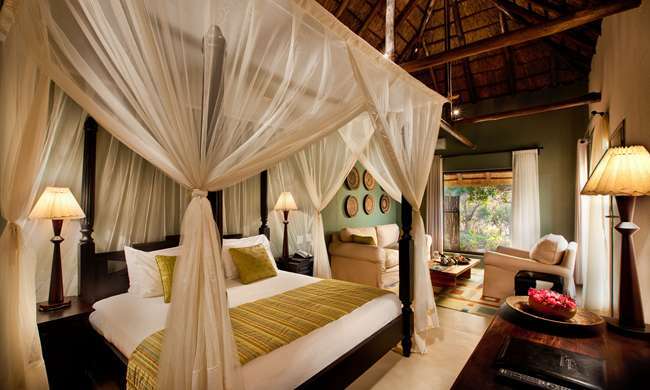 All rooms combine European Luxury with traditional African charm, flaunted as thatched-roof chalets. Don’t be surprised to meet a Bontebok or a Giraffe on the way to your room whilst walking through the wide spread and tranquil gardens. Individual Chalets and the perfect harmony between natural beauty and extravagant comfort offer you the most of privacy. Individual terraces allow you to listen to the natures symphony sounds. The Etosha Suites at Mokuti Lodge promise you an experience that feels more at home in an adventurous fairytale. Join our guides on a game drive at the Etosha National Park and catch a glimpse of the animals before they settle down and the heat of the day dawns upon them. And as the day winds down, observe the animals as they head to the waterholes to quench their thirst, as a scorching day turns into a magical night. The early morning hours promise breathtaking moments in Etosha National Park. A morning bush walk brings you up close and personal with nature. Allow our experienced guides to take you on a journey of discovery filled with entertainment, awakening all your five senses. Afterwards, enjoy a scrumptious breakfast and nature's sweet serenade especially for you. Experience a game drive on our 4300 hectares reserve. A sundowner leads you into the starry night and an opportunity to discover the thrill of nocturnal life and splendour not seen during the day. 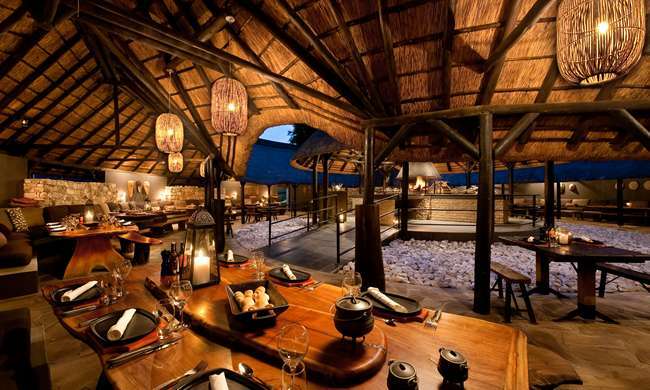 Sit down to a boma fire, enjoy a traditional meal alive with flavour and authenticity. 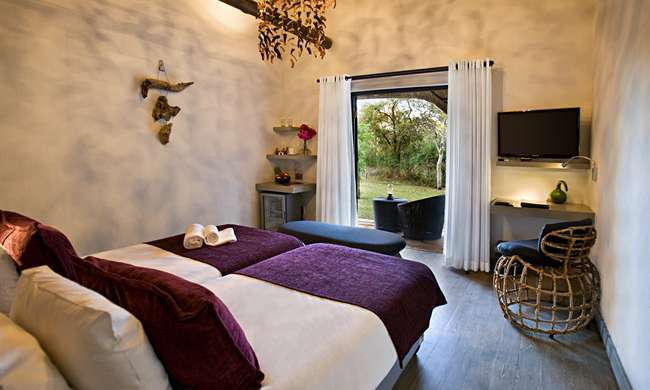 Sink into the call of the wild, owls hooting and the 'sawing' of the ever elusive leopard. Join our Conservation Team on a visit to the Ontouka Reptile Park and learn fascinating facts about African reptiles. Book your front row seat at a spectacular crocodiles feeding session! Inhabitants of the park include some of the world’s most dangerous snakes, crocodiles, turtles, goanna, chameleons and many more. After an exciting morning game drive the pool area with its comfortable sun loungers is the ideal location to relax and enjoy some cool drinks from our Pool Bar. We offer two swimming pools, one kids pool and the Etambi Pool Bar. 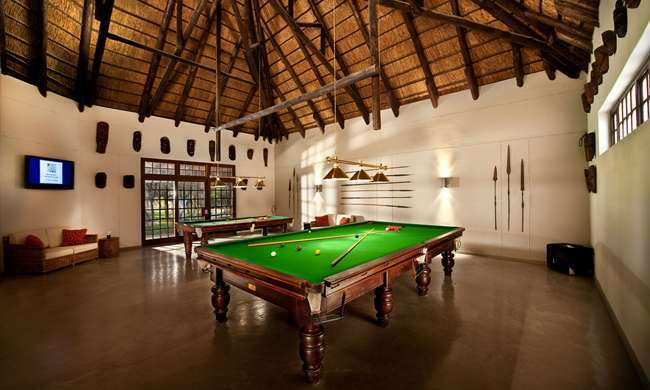 Mokuti Lodge offers two floodlit Tennis courts directly in the bush. A match you won’t forget! 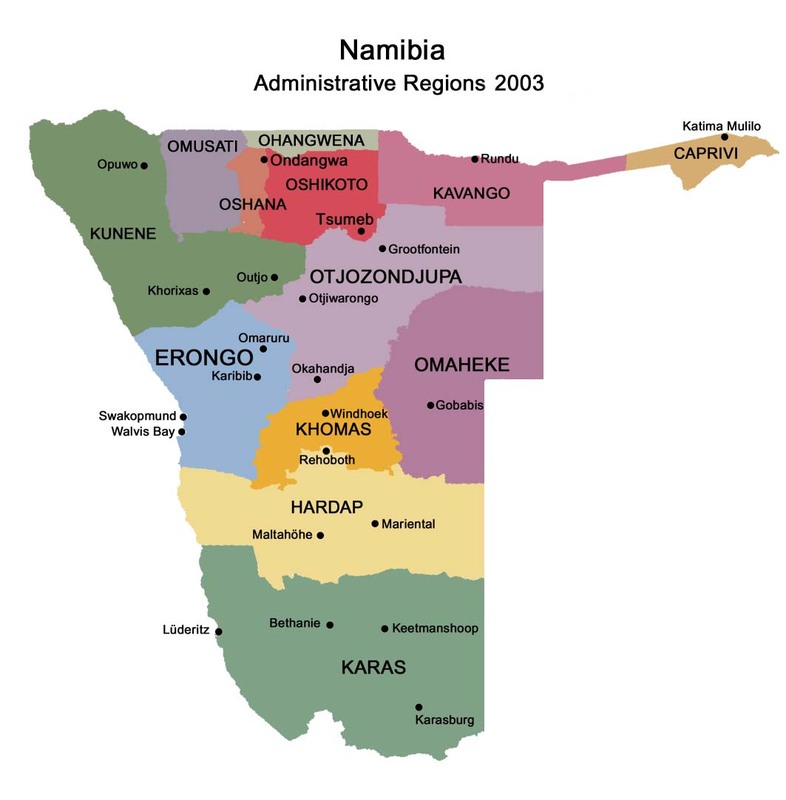 From Windhoek: take main road B1, and turn into C38 approximately 75 kilometres after town Tsumeb. The turn-off is signposted (road to the Etosha National park, Namutoni camp). The entrance to the lodge is on the left hand side just before the park's gate. Special meals can be booked in advance. Rates are subject to change without prior notice should tax be increased or Government levies introduced.